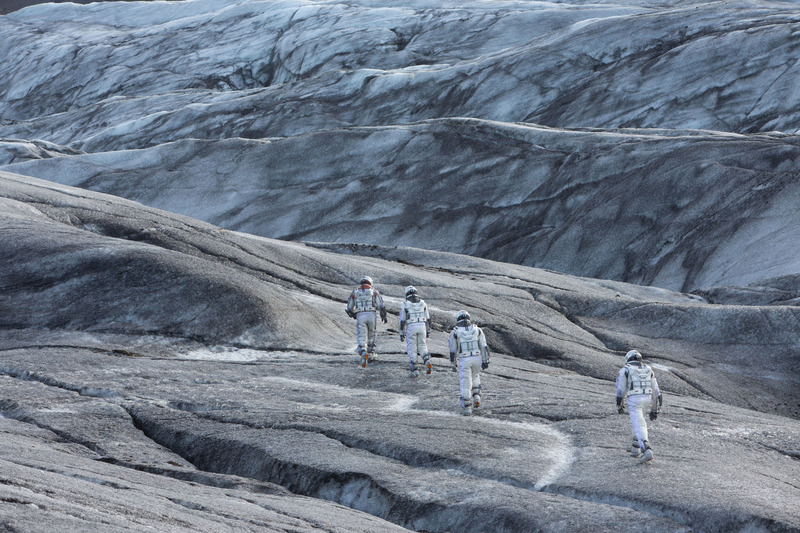 Outrageously ambitious, deliriously far-out and epically geeky, director Christopher Nolan’s sprawling Interstellar is a space movie with one foot on the ground and one in the stars, a story of both humanity and the heavens, with a thumping heartbeat driving its spewing intergalactic fountain of dazzling, digitized special effects. 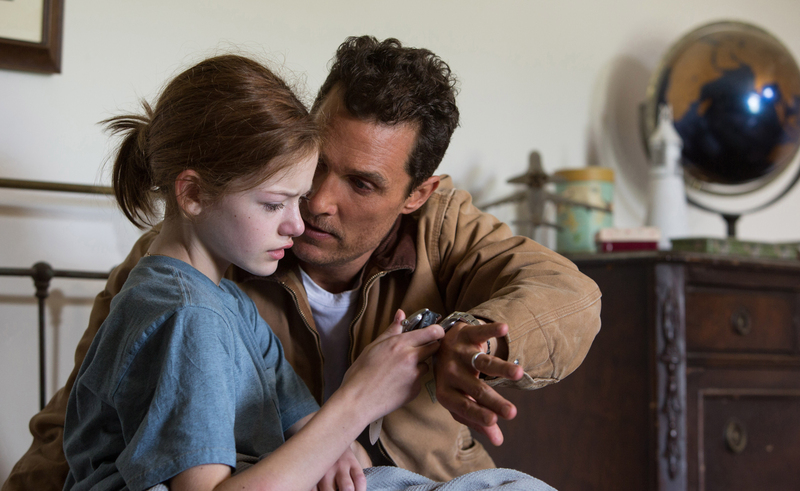 In this mind-bending yarn about gravity, time and the power of love, Matthew McConaughey plays a family-man space cowboy on a mission to save the Earth. As its story unfolds, sometime in the not-so-distant future, our planet’s resources have been all but exhausted; the world’s a big dust bowl. 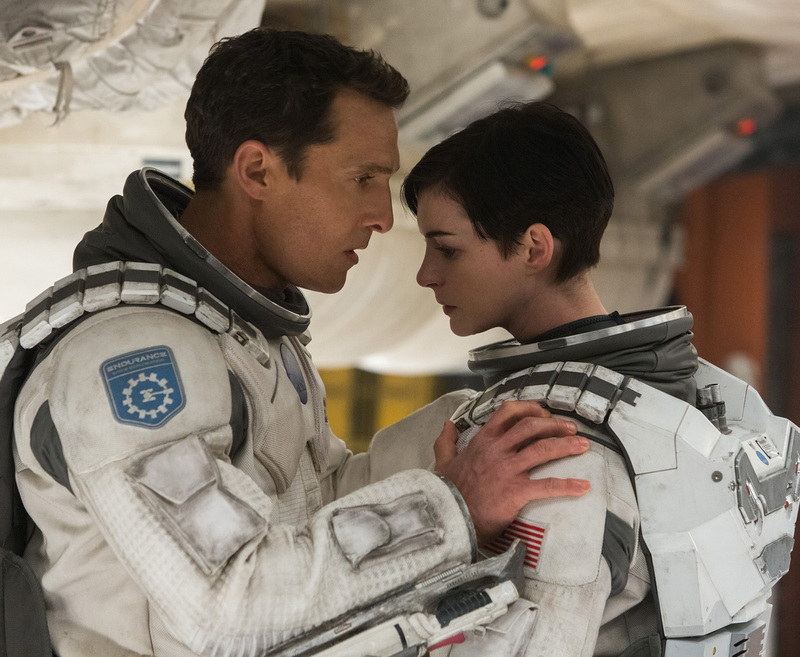 McConaughey’s character, Cooper, a former moon-exploring astronaut, is selected for a top-secret, last-ditch NASA dash across deep space to chase down a probe signal that may possibly signal a new planetary home. Big problem: The widowed Cooper will have to leave behind his sage old dad (John Lithgow) and his two young children, teenage son Tom (Timotheè Chalamet) and spunky young daughter Murph (Mackenzie Foy). Even bigger problem: Once he takes off, Cooper doesn’t know how long how he’ll be gone—or if he’ll be able to return. Cooper tries to reassure Murph—he gives her an old-school wristwatch and tells her that whenever she looks at it, she can know he’ll be looking at his, too, wherever he is, up there in space, for however long, until he comes home. Tick-tock, tick-tock. Nolan, whose other films include the Batman Dark Knight trilogy and the mind-scrambling Inception, sets off an explosion of images and ideas as the tale unfolds both “on the ground” and “out there.” We’re taken through a space “wormhole,” a shortcut expressway compressing and expanding space and time, to a watery planet prone to monstrous tidal waves, where every hour counts for seven years of Earth time, and another that’s so cold, even the clouds are solid ice. We watch as Cooper, whose own aging has been halted by the time-warp of space travel, sees video feeds of his children grown into adults (Jessica Chastain and Casey Affleck)—and bitter that their father has apparently abandoned them, “decades” ago. Anne Hathaway plays one of Cooper’s fellow explorers—a key role in more ways than one because of her connection to her NASA scientist father (Michael Caine) back on Earth, and also to someone the astronauts will meet on their journey to the outer reaches of the cosmos. Along the way, we’re introduced to some lofty concepts: Are we alone in the universe? Is it possible to go backward and forward in time, or to make it stand still? Is love a quantifiable force? Nolan lays out a narrative path between Odysseus, Albert Einstein and Buck Rogers, then paints it with bold cinematic brushstrokes inspired by the masters—Stanley Kubrick, Steven Spielberg, John Ford. It doesn’t always work, but man, is it ever something to see. It gets pretty trippy (and even a bit hokey) in the end, and at nearly three full hours, it’s quite a journey. And this rip-roaring Rip Van Winkle rocket tale is unlike anything else you’ve seen at the movies this year, if ever. Hang on for the ride and you may come out on the other side feeling a bit wobbly and time-warped yourself. And afterward, you might never look at the tick-tock of your wristwatch the same way again.